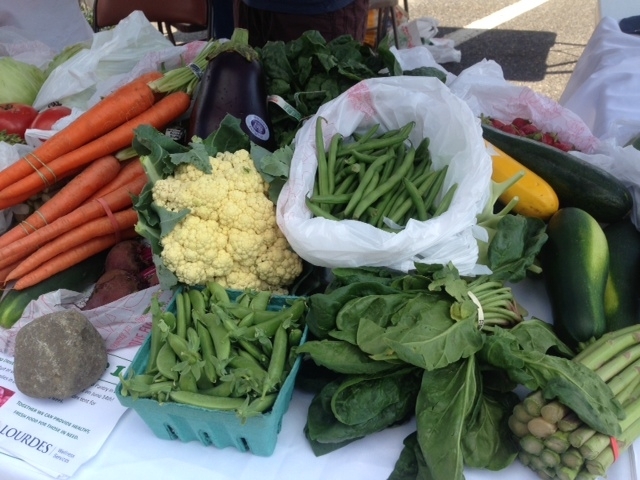 Hello, Vendors, Artists, and Friends of the Collingswood Farmers’ Market! Hello sweet corn, field tomatoes, raspberries, blackberries, blueberries! Not Sunny. This forecast keeps changing but not getting better. Certainly very humid, with an increasing likelihood of rain as the morning progresses. Winds get stronger too as we approach noon. Bring and use tent weights. Barry Savoie and Les Viereck suffered crop and structural damage but will attend the Market SAT JUN 27. Rick Hymer lost power and probably won’t get it until Sunday. He’ll be at the farm Saturday monitoring his generators. Far Wind Farm lost 450 laying hens and will not have eggs to bring to the Market this week, and probably not for months. Two Guests, Green Aisle Grocery and Market Day Canele, will take spaces inside the Market. 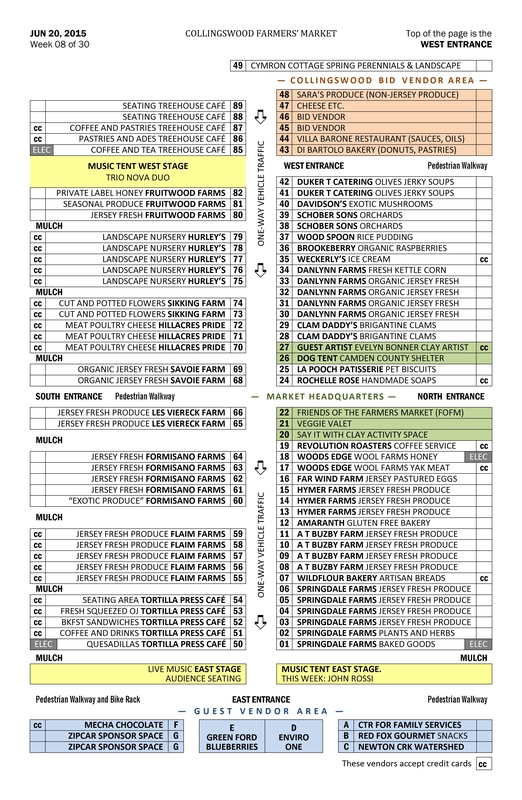 Both of our seasonal berry vendors—Brookeberry and Green-Ford— will be in attendance. John and Kira’s Chocolates, SOOM Foods and Neil’s Sharpening Service will share the Guest Vendor area. Former Market Director Betsy Cook will assume her new role as clothing designer for this week’s Market. She’s bringing lots of beautiful garments and very affordable prices to the usual Guest Artist Space 27. Local vegan chef and children’s cooking class instructor Patrice Leonetti will turn local produce into healthy, ready-to-eat dishes. Meanwhile, Market sponsor Extraordinary Ed will provide an informative and educational demonstration in the Sponsor tent. Local businessman and popular musician Sam Caruso is back again this week, at the West Stage, in the shelter of the Speedline. Meanwhile She Hates Me will command the official Market Music Tent, sponsored by Collingswood Music. The New Jersey Aid for Animals agency will staff the new Dog Tent for us this week, continuing to register dogs that haven’t yet bought their official Market Leash Permits. Perennial favorites, DiBartolo Bakery, Villa Barone Restaurant, Cheese Etc., and Sara’s Produce will all attend. No others have reserved BID spaces. 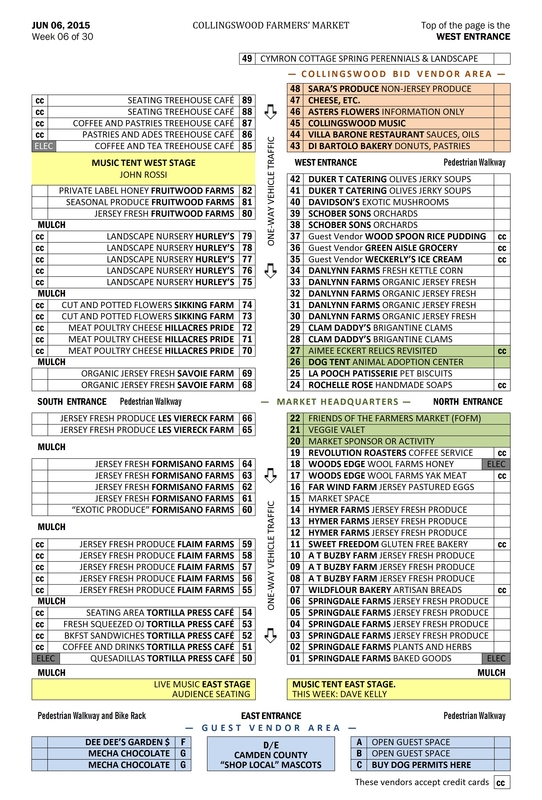 Mike DiBartolo of DiBartolo Bakery is your contact for all questions regarding BID participation at the Market. (609) 949-3424 cell for voice or text. Looks like a beauty. 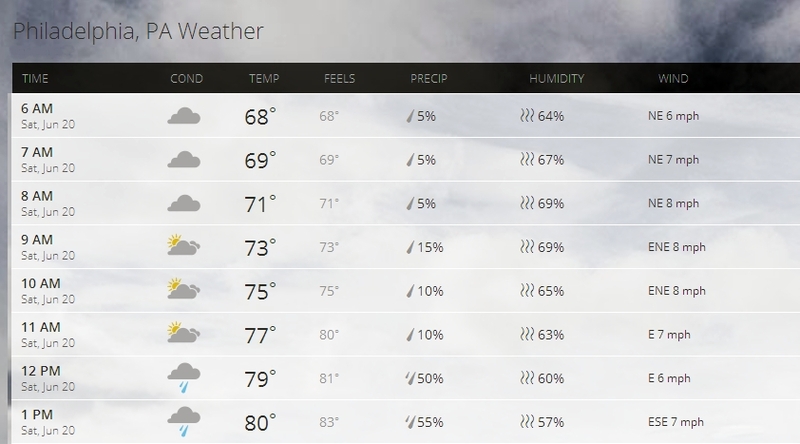 Ordinary humidity for the season with little chance of rain until . . . well, it gets a little chancy around noon. Temperatures in the mid 70s. Light winds. 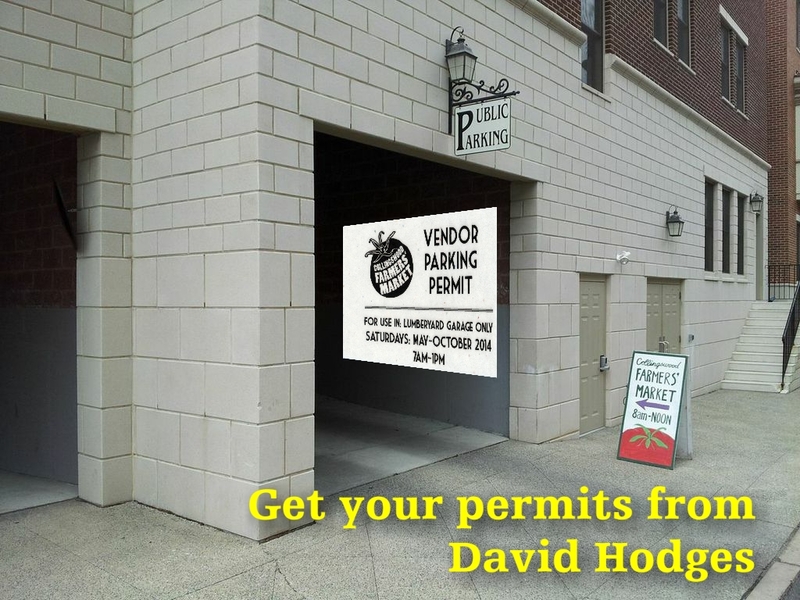 Three Guests, Wood Spoon Rice Pudding, Brookeberry Farm, and Weckerly’s Ice Cream, will take spots inside the Market. The Brand new Red Fox Gourmet will bring “artisan snacks” to the Guest Vendor area, where we’ll also host MECHA Chocolates beneath the shade of the Speedline. BERRIES COMING In addition to the Jersey Fresh organic raspberries and blackberries from Brookeberry Farm, we’ll also host Green-Ford Farm with their popular local blueberries from Pemberton. Evelyn Bonner has been working hard to produce a wide variety of succulent planters for our Market this week. Her name has changed since last year, but her business is still Evelyn Taylor Designs. Look for her in the customary Guest Artist Space 27. Trio Nova Duo is back again this week, at the West Stage, in the shelter of the Speedline. Meanwhile John Rossi will command the official Market Music Tent, sponsored by Collingswood Music. The Camden County Animal Shelter will staff the new Dog Tent for us this week, continuing to register dogs that haven’t yet bought their official Market Leash Permits. Looks like a beauty. Weather will be humid overnight Friday, but very little chance of rain Saturday, with temperatures climbing through the mid 70s to the upper 80s. SUMMER is HERE! Gets windy as the day progresses. Bring your tent weights. Three Guests, Green Aisle Grocery, Market Day Canele, and Constellation Collective will take spots inside the Market. SOOM Tahini and John & Kira’s Chocolates will set up shop in the customary Guest Vendor area. We’ll also be visited by a Peace Corps Recruiter and representatives from AQUA Corps. BERRIES COMING The Jersey Fresh organic raspberries and blackberries from Brookeberry Farm are not ripe yet. Neither are the blueberries from Green-Ford Farm. Green Ford expects blueberries for SAT JUN 20. 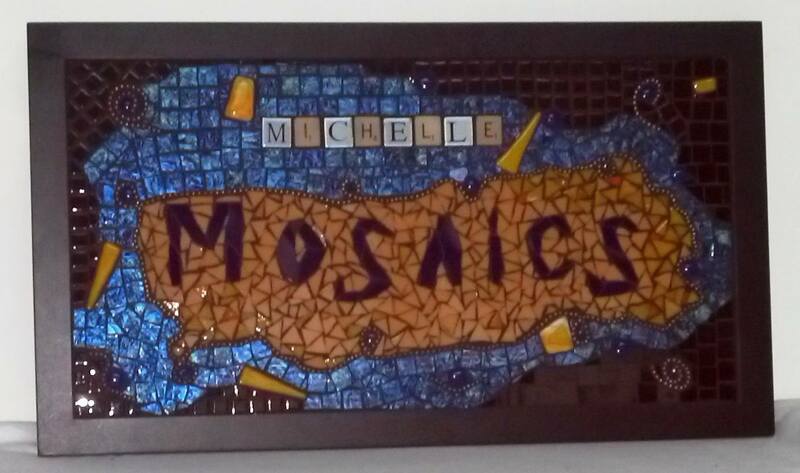 Michelle Bross (Michelle Mosaics) is our Featured Artist for SAT JUN 13. She makes wall hangings, mirrors, garden art, mailboxes, and house numbers. We’ve set her up beneath the Speedline because she doesn’t have a tent. 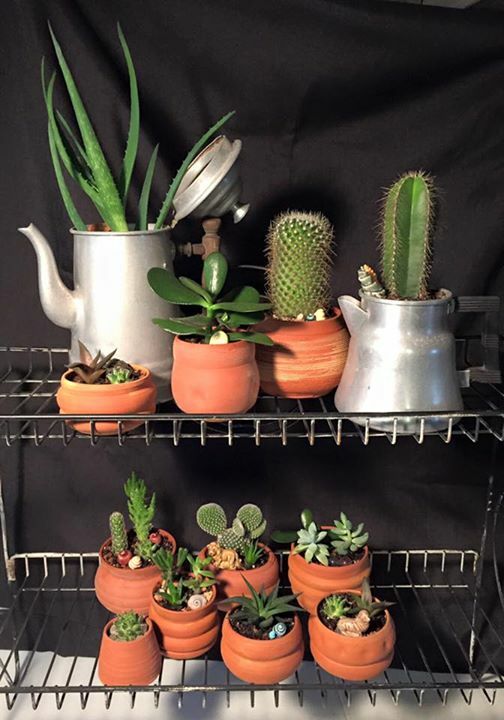 Look for her in Guest Vendor Space G. Check out her facebook page. This is the week for the monthly Buy 2 / Give 1 campaign that has fed so many of our food-vulnerable neighbors. 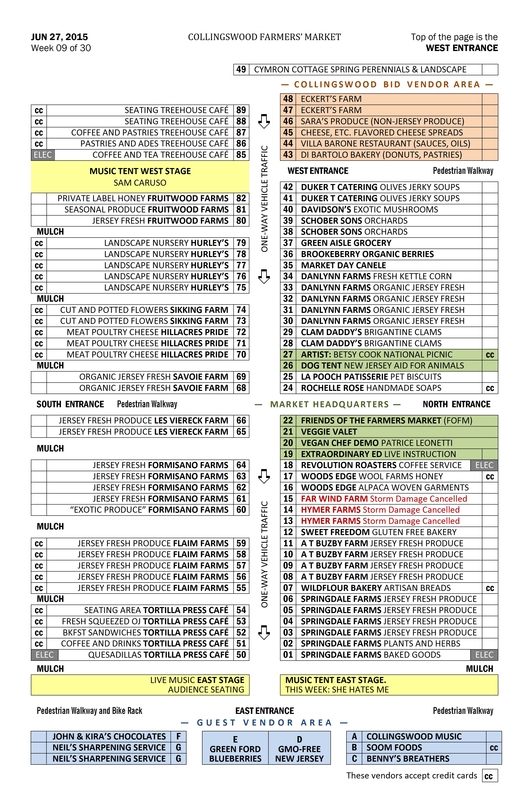 Encourage your customers to pick up an extra bit of produce for the effort. Fresh fruits and vegetables are rare and extremely desirable items at a food pantry. Dave Kelly plays the West Stage, in the shelter of the Speedline, and Trio Nova Duo will command the new official Market Music Tent, sponsored by Collingswood Music. The Almost Home Shelter will staff the new Dog Tent for us this week, continuing to register dogs that haven’t yet bought their official Market Leash Permits. Hello, Vendors, Artists, and Friends of the Collingswood Farmers’ Market! Goodbye, strawberries; hello, early tomatoes? Looks like a beauty. Weather will be humid overnight Friday, but very little chance of rain Saturday, with temperatures in the comfortable 70s, and cloud cover. Winds will be light. 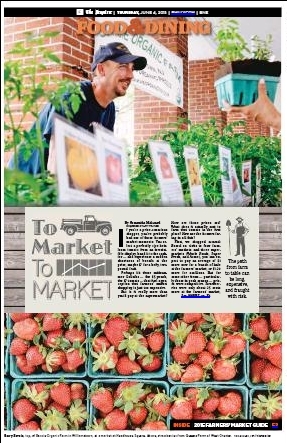 Today’s (THU JUN 04) Philadelphia Inquirer ran a long story about Farmers’ Market prices in its Food and Dining section. By and large, the author went to pains to justify what some shoppers perceive as high produce prices at Markets. You may or may not be able to read the story at this link: Press Reader. I paid 99 cents for access to the article; I have no idea whether it will open for you. Part of it looks like this (including a dandy photo of our own Barry Savoie). Three Guests, Green Aisle Grocery, Wood Spoon Rice Pudding, and Weckerly’s Ice Cream will take spots inside the Market. MECHA Chocolates and Dee Dee’s Garden will set up shop beneath the Speedline. We’ll also be visited by Mascots representing the Camden County “Shop Local” program. Aimee Eckert curates our Artist of the Week program and selects participants for the Handmade Holidays observance. She’s also an exemplary jeweler in her own right, and we’re delighted to host her as our Guest Artist this week in space 27. 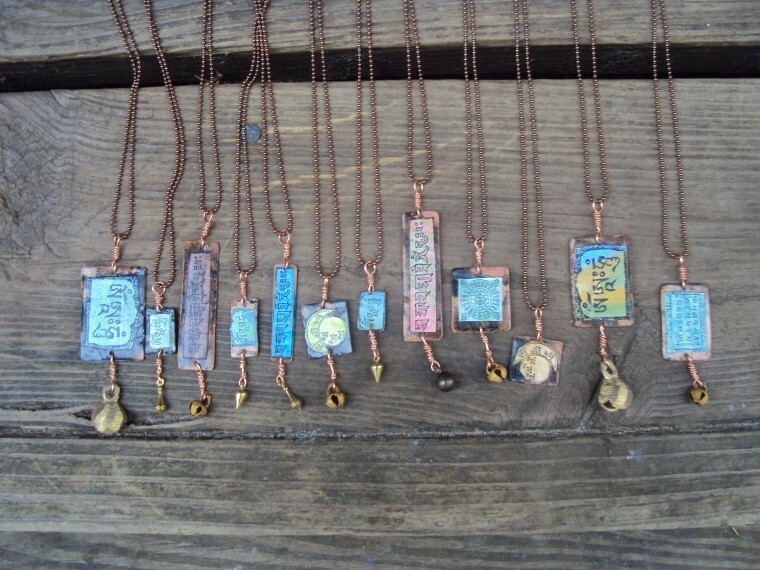 Aimee’s jewelry collection, sold under the name “Relics Revisited,” is constructed from original photographs, vintage bits, metal, clothing and various found and reclaimed odds and ends. She takes the original found item and alters it to give it a new life. Her collection is a careful mix of collage art and metalwork using a variety of ideas that make each piece one of a kind. John Rossi plays the West Stage, and Dave Kelly will command the new official Market Music Tent, sponsored by Collingswood Music. The Animal Adoption Center will staff the new Dog Tent for us this week, continuing to register dogs that haven’t yet bought their official Market Leash Permits. This won’t be easy, but it’s necessary. 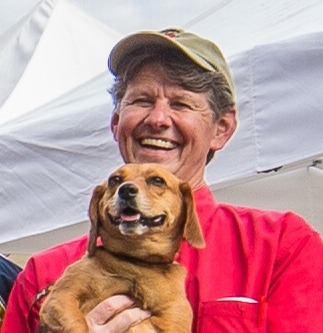 If good dog behavior is important to you, you’ll comply beginning this first Saturday in June with the No Permit, No Purchase policy, declining to serve customers who don’t choose to cooperate with the Permitting and Behavior Guidelines. 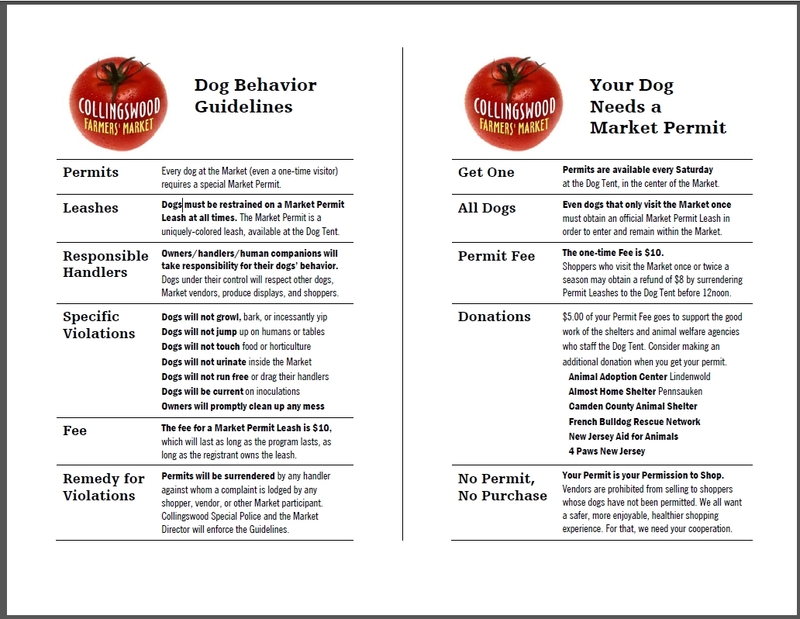 David Hodges will distribute a small batch of Dog Behavior Guidelines to all vendors for distribution to anyone who appears at your table attempting to make purchases with a non-permitted dog. Perennial favorites, DiBartolo Bakery, Villa Barone Restaurant, Cheese Etc., and Sara’s Produce will all attend. We’ll also host representatives from Collingswood Music and the new Aster’s Flowers. 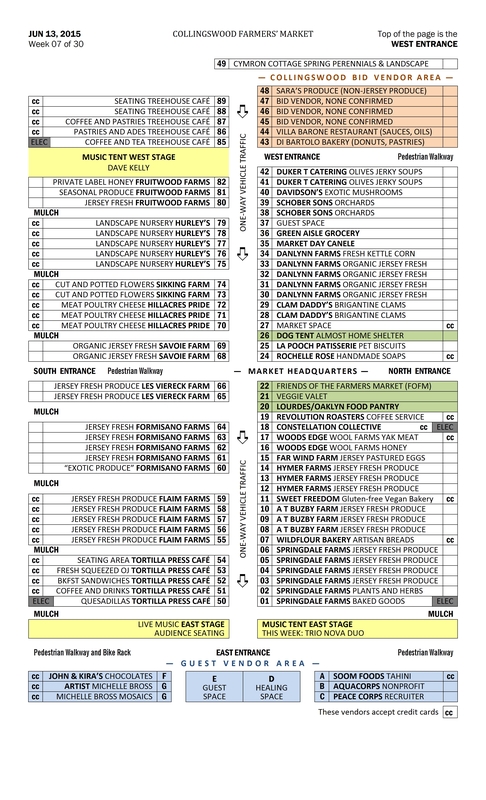 Mike DiBartolo of DiBartolo Bakery is your contact for all questions regarding BID participation at the Market. (609) 949-3424 cell for voice or text.